The factory team Praga Kart Racing participated this weekend on the opening series of WSK Super Master Series near Italian Sarno. The setup was even stronger than at La Conca race. Besides stable pilots, Patrik Hájek and Jonathan Thonon, a Spanish driver Jorge Pescador competed in the KZ category. In category KF Praga had Karol Dabski, Marino Sato and a newcomer to the team Diego Bertonelli. As for the Praga youngest pilots, Rasmus Lindh and Lukáš Podobský were not missing. In relatively short intervals between the races, the team mainly focused on the preparations for class KF. The preparations were successful as it was seen among all 3 drivers in the trainings and also in the heats. The weather was nice until the prefinals when the conditions changed and the track was wet. The team was able to quickly change the setup to wet conditions and all the drivers made it to the finals at front positions. Even at very windy conditions Karol Dabski managed to fight his way to the 7th position which assures him entrance to next Super Master series. Closely after the Top 10 the new Praga driver Bertonelli took his place, showing himself in a very positive light. The juniors were not so lucky and none of them made it to the finals. The main cause was a mix of several factors- lack of experiences on fast tracks and a lot of additional weight for the required standards. 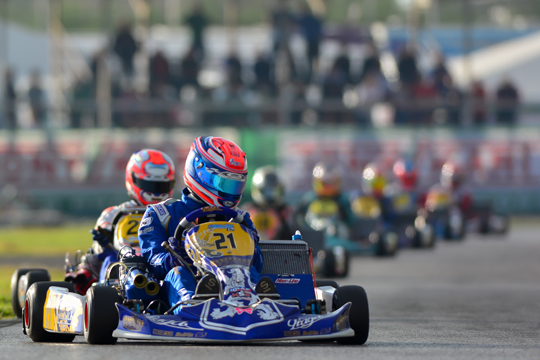 Drivers of category KZ were unable to create an adequate space on the track which corresponded to their track times, however during the heats they fought their way back to the front. Especially Jonathan Thonon had a great start to the finals. Great majority of the final race Jonathan maintained on the 2nd position with a safe distance. His chassis was however not setup for such a wet condition resulting him to drop to the final 7th position. Complete opposite was Patrik Hájek who with his systematic driving style fought his way to the 5th final position which is also a ticket for the next race. The most successful driver of the weekend was Patrik Hájek. "This weekend proved us that the combination of Praga chassis and Iame engine has a speed, and I value this fact from several reasons. First of all the weather conditions were really extreme and the second reason is that there were the top pilots of categories KF and KZ present here in Sarno. The Master Series has 3 parts, therefore it was crucial to leave Sarno with good points. And we managed to. I would like to thank all the people who contributed to this result. Now we are preparing for the next race." Next start for the factory team Praga Kart Racing will take place in the middle of April at Castelletto circuit at the WSK Super Master Series.